RS 04 Back to the Future Ep. 1: - "It's About Time"
There is a strong possibility that any conversation with Back to the Future as the topic will have a nostalgic undertone to it. The movie transcended the limitations of one genre, as it consisted of comedy, sci-fi, romance, and even a little bit of action. The characters were relatable, led by the typical teenager Marty McFly who risks his own existence by preventing his parents’ first encounter (and really, if you’re a fan of geek culture, I should not have to give details on the plot). When Telltale Games revealed they were working on a video game for this iconic film, expectations would be fairly high. Yet, if I may imitate a classic line from the movie—if you’re going to build a time-travelling game based off a time-travelling movie, why not do it in style? 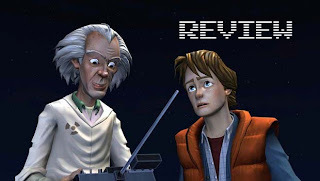 Back to the Future is a point-and-click adventure game, divided into five “episodes.” The first episode begins with Doctor Emmett “Doc” Brown sending Einstein through time, to an unknown destination. Doc soon finds out he has made a mistake and the player also finds out that the plot deviates from the movies. It is up to Marty McFly to rescue Doc from the time-stream. One of my biggest concerns before playing the game was that it would lack the “soul” of the movies, and that it would cash in on the success of the franchise. Those fears were immediately erased after hearing Christopher Lloyd resume his duties as Doc Brown. A.J. Locascio is responsible for filling the shoes of Michael J. Fox, as Marty McFly. It is rarely evident that Fox is not a part of this iteration of the franchise as Locascio does a phenomenal job playing the out of time teenager. Telltale blends the animation and art style well to create a product that stands out. They decided to design the characters with more cartoonish traits, not like the 1991 television series. While the animation isn’t groundbreaking, the art style allows the characters’ to convey their emotions by their facial animations. The game-play consists mostly of solving problems by visiting different spots and finding clues in Hill Valley, California. While some of the problems are linear and can be solved without much thought, others require more attention to detail. It allows for a good balance but at times is also tedious. I’m not saying I want a game to hold my hand through it, but at the same time at least tell the gamer where to begin. Moving around Hill Valley is a bit slow and sluggish. There are also many invisible walls in the middle of the town, not allowing for free roaming. While it is a point-and-click adventure, invisible walls force the game to be linear and also take away from the player being immersed in the world. The most pleasant part of the game is some of the winks and nudges to geek culture related to the movie. I could say what they were, but it does take the fun away from discovering them. The new characters introduced, such as Edna Strickland, are great fits for the Back to the Future universe. They could easily fool a player who has, for some reason, never watched the movies before. For an experience that lasted all of two hours, Back to the Future Episode One does its job of setting the stage for the four remaining episodes. It is not a perfect package, maybe not even a great package. It is a great trip down memory lane for a fan of the franchise, and also a pleasant experience for anyone with a few hours to spare. Here’s hoping the next episode hits 88 MPH and generates 1.21 Gigawatts of great gaming.